In 808 A.D. the Danish King Gudfred sacked the Slavic town of Reric located on the Southern coast of the Baltic Sea. After destroying the port, the tradesmen and craftsmen of the town were relocated to the young, Danish city of Hedeby on the Jutland Peninsula. In only a few short years, Hedeby rose to be the largest trading city on Viking trade routes and dominated the Baltic Sea. 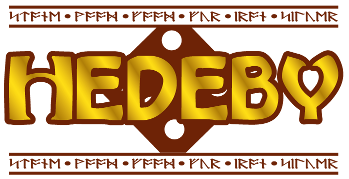 Hedeby is a light European style game that should play in under an hour. With more than four players, it can take a little extra time. Setup is quick and is never the same twice. The play is quite a bit like your favorite deckbuilding games, but with a handful of dice instead of shuffling decks. As you progress through the game, buying more expensive buildings, you will begin to take charge of the randomness of the rolls. You can focus on building the most buildings and buildings or gaining the most favor from the gods for alternate paths to victory. Hedeby happened a little differently than most games on this site. My intention here has always been to share the creation process from the beginning. I've done that with some vague pictures in the Weekly Updates section, but I really only shared it with a private test group at first because I wasn't sure the game was ready. Well, it is now... so here it is! 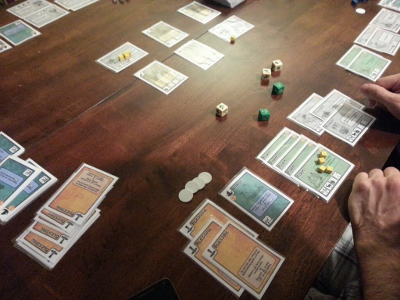 It still needs a ton of testing, but it's a solid game and I will be seeking publication for it.